I sit here at my desk with a bowl of wild peas sitting next to me. A few days ago I ate a lunch of wild carrots, and earlier this week Holly and I ate sauteed Amanita vernicoccora as a side dish with seared wild duck. With the exception of the duck, all three of these foods strike fear into some, draw blank looks of ignorance from others. Amanita wha? Isn’t that the poisonous mushroom? Wild carrots and peas? Aren’t they just like the kind we buy in the store? What’s the big deal? The “big deal,” to some wild plant aficionados, is that wild peas are allegedly toxic and wild carrot, to them, is indistinguishable from poison hemlock. This is, of course, false. But it took time, study and effort to come to that conclusion. 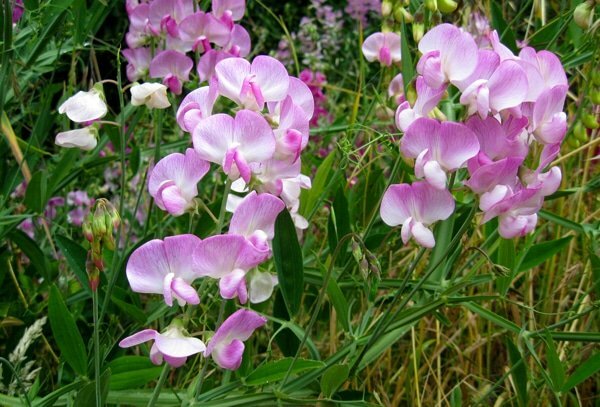 Wild peas do have some toxic properties, and sussing out how to eat them safely required considerable research. 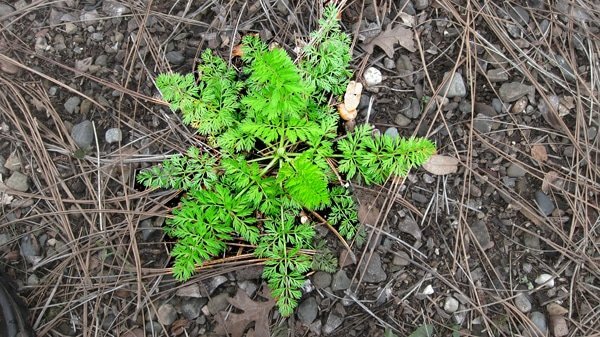 Wild carrots do kinda-sorta look like hemlock, until you train your eye to look for the key differences between the two; now I can tell the difference at a distance. 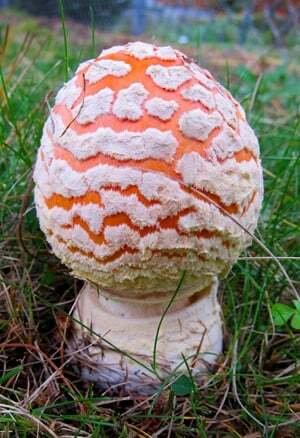 And yes, the genus amanita has quite a number of poisonous species, including a few that will kill you dead. Learning what — exactly — the edible species look like took years of observation before I took that first tentative bite. I am betting most of you reading this are wondering why in hell I would even bother to do this sort of perilous research, when there are supermarkets and farmer’s markets and gardens full of known, edible and delicious plants and animals ready and waiting to be my next meal. Sometimes I ask myself the same question. The answer is simple, really. For starters, you are not so safe as you may think in your local supermarket; more on that later. More importantly, however, the salient fact is that Homo sapiens is designed to eat a little of a lot, not a lot of a little. Along with rats, we are planet earth’s most successful omnivores — we will eat anything we can, even things that eat us. Yet modern humans, Americans especially, have wittingly or unwittingly truncated our diets so severely that now we eat a lot of a little, no longer a little of a lot. This has consequences. As a species we must reverse that trend, bit by bit, by being better omnivores. An easy way to do this is to eat more unloved meats or fish. But with the exception of certain tropical fish and the livers of polar bears, most of earth’s fauna are known to be edible. Plants are more of a mystery to us. Flora, and the even more mysterious mycological kingdom, are where our Omnivore’s Dilemma truly reside. My hope is that what I do helps you solve it, little by little. The first time I ate an amanita mushroom it was a single cap of A. muscaria, boiled three times to — I hoped — remove all of the muscimol toxin, patted dry and then fried crispy; I am a sucker for anything crispy. I told Holly what I was doing, and to watch me in case anything weird happened. Now A. muscaria isn’t deadly, but it is hallucinogenic unless you eliminate the muscimol, which, as it happens, is water soluble. I sat there on the couch watching some movie with lots of explosions (I am also a sucker for movies with explosions), and well, nothing happened. The processing worked. I collected wild carrot for years before I ever ate any. If you are like me, you have at least two voices in your head that, like long-married couples, love each other but argue on a daily basis. Dumbing it down a little, it’s basically like that scene from “Animal House” where the kid has the angel on one shoulder and the devil on the other. “C’mon, you know you know your plants. There is no way what you’re holding is hemlock!” That’s the devil, the one that is inordinately proud of my long history with wild plants. “You may be right. But is it worth your life?” That’s the angel that has guided me through nearly 40 years of messing around with wild flora without once poisoning myself. So for years I laid off. Until recently. I finally screwed up enough courage to eat one piece. I have a sick sense of humor, so I picked up a copy of Socrates to read while I waited to see if I needed to call 911. (If you don’t get that one, look it up.) Again, no worries, mate. So the next day I ate a little bowl of glazed wild carrots. They were nice, more parsnip-like than carroty, but hey, I lived to tell about it, right? Now I’ve lost my fear and eat them with impunity — but not without careful observation still. 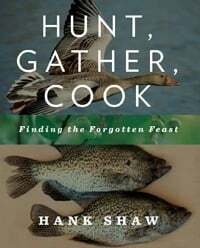 I wrote in the introduction to my first book, Hunt, Gather, Cook: Finding the Forgotten Feast, that we live in an edible world. We do. Tens of thousands of plants and mushrooms on this earth can help us in some way, whether as a staple or spice, occasional meal or medicine. They live all around us, if only we know where to look. And it is precisely by eating this way that our species became so successful: For roughly 190,000 years humans were hunters and gatherers — and far longer than that if you want to go back to our uncles H. habilis and H. erectus. Agriculture changed that. It narrowed our horizons immensely. Yes, I would not be writing this on a computer, or, for that matter, writing at all, if it were not for “civilization.” This 10,000-year experiment of ours has not been without benefits, an easy bowl of cereal with milk being not the least of them. Don’t think for a minute that a supermarket diet is without its own peril, however. Tainted food is a commonplace, and many of the seemingly wholesome vegetables in our produce departments have been grown in such a way that they’ve become wan shadows of the real thing. The siren song of sugar and fat and alcohol can be every bit as lethal as a bowl of hemlock, if not as acute. But I am not interested in pitting a wild diet against a store-bought one. My own diet is a hybrid of both. When I take that first bite of a new plant or mushroom, I am tasting the unknown, with all the trepidation that entails. Doing so makes me think long and hard about what’s on my plate — indeed, whether it’s even food or not. And that, I think, is not something only a forager ought to do. Cheers for this great post. Fear of consuming something poisonous is almost always the knee-jerk reaction I get when telling someone I eat wild food. I find it highly ennobling, however, when one can develop this kind of deep connection with their food, knowing exactly who and what it is. Supermarket foraging just doesn’t activate the senses in any comparable way. Rachel, I love that you know what rat piss smells like (though having had pet rats before, I’m not sure I could actually distinguish between various types of animal pee). Hey Jessie, I live in coastal N.C. and would be happy to show you what I know. Thanks Mr. Shaw for the great web site and the honest writing. Jessie, just post your email if your interested.